Awarded to members of the Armed Forces who, while serving in any capacity with the Army in a non-combat area on or after 1 August 1981, distinguish themselves by meritorious service or achievement. 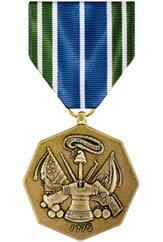 The Army Achievement Medal is awarded to members of the Army or other Armed Forces serving in any capacity with the Army in a non-combat area. 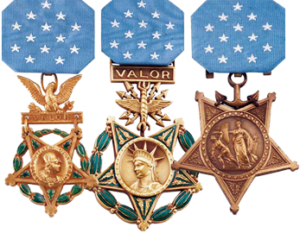 It shares the same level of precedence as the achievement medals of the Air Force, Navy/Marine Corps, and Coast Guard however, unlike the other 3 achievement medals which can be awarded with the Bronze "V" device for valor, the Army award is strictly for non-combat service or achievement.